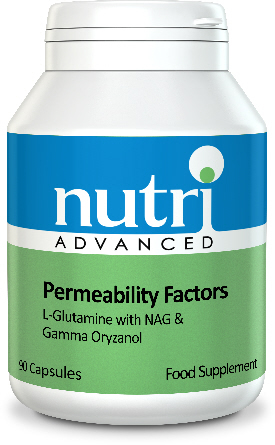 Nutri - Permability factors L Glutamine plus synergistic factors helps protect the mucosal cells of the small and large intestine, which provide a protective barrier against infection. One of the many hazards of modernday living, poor nutrition and exposure to environmental toxins is increasedintestinal permeability. When intact, the lining of the intestines provides amucosal barrier. When the intestinal lining is compromised, however, toxins,undigested food and allergens can "leak through”. Permeability Factorsnutritional supplement is a formula that may be helpful for those withintestinal permeability problems. L-Glutamine helps protect the mucosal cells of the small and large intestine, which provide a protective barrier against infection. Studies using L-Glutamine have shown excellent results in helping to relieve digestive disorders. N-Acetyl-D-Glucosamine is one of the building blocks of cellular tissue. Gamma Linolenic Acid (GLA) is a precursor to the series 1 anti-inflammatory prostaglandins. Gamma Oryzanol (natural extract of rice bran oil) is a soothing intestinal plant substance, rich in phytochemicals and antioxidants, such as phytosterols, beta sitosterol and ferulic acid esters. Gamma Oryzanol’s mechanism of action is thought to be its ability to help normalise the nervous system’s control of digestive secretions. Gelatin, MagnesiumStearate and Silicon Dioxide.